The episode opens with Clarke doodling Lexa while she sleeps. Lexa jerks awake and tells Clarke she's been dreaming of former commanders. Apparently they aren't happy with Clarke's 'blood must not have blood' mantra, and Lexa's willingness to go along with it. Dreaming about former commanders is most likely a side-effect of being a Nightblood, which raises new questions and a theory I'll mention at the end of the recap. While Clarke and Lexa speak, Titus enters the room with a box. Inside the box is a present - from King Roan, no less. But it isn't for Lexa - it's for Wanheda. They open the box and - SURPRISE! - Emerson, the last remaining Mountain Man and the reason Mount Weather blew up with Clarke's people inside, tumbles out. Roan, you're such a romantic. 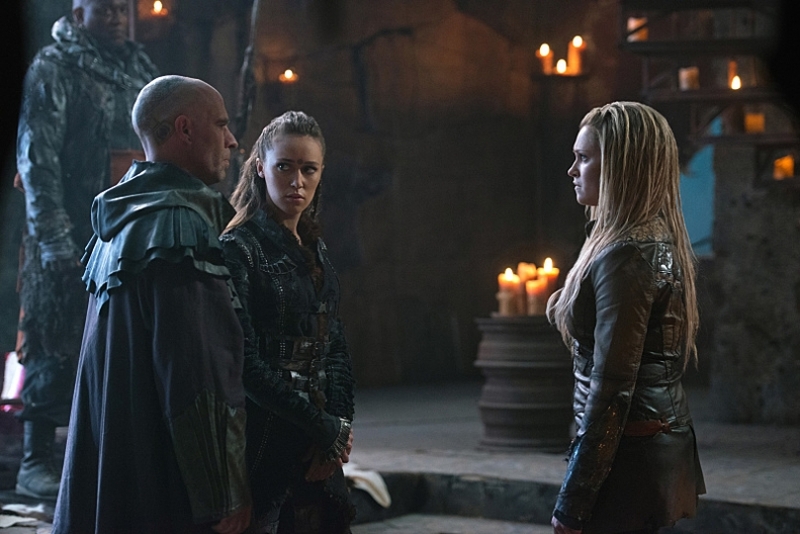 Lexa tells Clarke she has a choice: Kill Emerson, or release Emerson into the wild. I mean, banish him. 'Blood must not have blood' seems all well and good until it's personal, and Clarke chooses death for Emerson. Well, until the very last moment, when she changes her mind. At least she stands by her principles, although I agree with Titus - 'blood must not have blood' isn't going to work yet. It takes two sides to have peace, not just one. Meanwhile, Kane continues to be awesome (if somewhat haggard and nap-needy). He's in cahoots with Octavia, trying to clean up the devastating mess Pike is leaving behind. Bellamy is still struggling with Pike's order to wipe out a nearby Grounder village so they can use the soil to plant food, but he goes along with it anyway. Octavia sneaks to the village to warn the Grounders, but 'you should all evacuate' doesn't sit well with them. Especially since they're the women and elderly left behind from Pike's massacre. They knock Octavia out and release poisonous fumes into the air when Bellamy and his strike team arrive. Monty, the pure gift that he is, risks his life to save Monroe from the poisonous gas, but he's too late. Monroe dies, gasping for air, and this appears to shake Bellamy up. He can barely meet Pike's gaze later when discussing it. Abby is concerned about Jaha's new happy pills, and approaches Jaha about them (narrowly stopping Jasper from swallowing one). Alie tells Jaha he can talk to Abby, and so Jaha tells her they're silicone-based painkillers that block pain and increase endorphins. Abby confiscates the pills, saying she wants to test them, and then asks, "Would you let Wells take one without testing it first?" Jaha blinks and asks, "Wells?" Even Alie appears startled by the fact Jaha has forgotten his own son, and Abby's concern increases exponentially. She and Kane share a quiet moment where she voices her concerns and reassures him. It's so lovely to see one of my OTPs actually sailing. It's probably going to wreck soon. One of them will die. Something. Alie and Jaha recruit Raven to find Alie's update somewhere in the Ark's computer files, but Raven can't find anything. They decide it must be in the thirteenth pod, Polaris (from which we get the name of Lexa's capitol, 'Polis'). Cut to Murphy being tortured by none other than Titus, who seems desperate to find the source of the happy pill he found on Murphy. Yikes, Titus. I guess you aren't as chill as I thought you were. We still don't know what Nightbloods are, exactly. But Lexa has dreams of the other commanders, all of whom were also Nightbloods. The tattoo on Lexa's back looks suspiciously like a pod falling from the sky. Are Nightbloods possibly the descendants of those who fell from the thirteenth ark, and were they on the happy pills Alie's been handing out? Jaha isn't going to win any Father of the Year award, but knowing what the pills are leads to more questions. If they don't actually heal but rather block pain, won't there be dire consequences? Raven isn't healing, she just isn't feeling the pain. So what happens when the effects of the pill wears off? Or will it? Why is Titus after information about the pills? Will we see Emerson again? CAN ROAN GET SOME MORE SCREEN TIME, PLEASE? Will Monroe's death shake some sense back into Bellamy? Did you see the episode? What did you think? Any crazy (or even sensible) theories?